A punching bag sound installation in collaboration with Andi Stolze. The more the audience hit the punching bag, the quieter gets the loud drone in the room, and as soon as people stop beating, the sound in the room gets loud and complex again. Featuring a set of voice samples by Jacques Palminger which can be triggered with special strikes, humorously affronting German boxer-idol Henry Maske. This installation has been premiered at the Dockville Festival in Hamburg in 2009 and has also been shown at the Golden Pudel Club in 2010. A car cockpit built onto the rooftop of the Jaaga building in Bangalore (India). The idea is to play the soundscape of a city which is dominated by the noise and sounds of traffic. Operating a steeringwheel and pedals which are designed for computer games, the player will change the sound captured live on the street with microphones. It’s never quiet in Bangalore. "Overdrive" was set up and running throughout the year in 2011 at Jaaga in Bangalore (India). It can be re-built in any other city. Here is a review on popupcity, and here is video documentation of the setup. A room sound installation together with Jan St. Werner and Florian Grote. Jan St. Werner turned the venue of the main stage of the 5DaysOff Festival at the Melkweg in Amsterdam into a warped experience. He created the visual elements together with the visual artists Diango Hernandez, Rosa Barba and Anne Pöhlmann. Florian Grote and Andi Otto set up a 10 channel speaker system invisibly in the architecture. After each show the recording of the concert echoes in the room, subtly, with shifts in delays and resonances. The idea was to distort the memory of what has just been listened to in an aesthetic way apt to the venue. Premiered in 2004. More info on applied-listening-arts. An interactive sound installation which presents two videogame controllers in a room equipped with a surround sound speaker system. Two players can play different sounds, create patterns and harmonies and move them in the room. It feels like playing a videogame, just without the screen. The sound material consists of an ambient harmonic pad for one controller and digital artefact percussion sounds for the other. Loop Kitchen was premiered at the Fusion Festival in Lärz in 2009. The composer and musician Sven Kacirek has worked with Tschaikowski's "Nutcracker" music in many different ways in the past years. I have developed this sound installation together with him, it was displayed in the foyer at Kampnagel (Hamburg) in winter 2012, where hundreds of people were lingering, waiting for the doors to open for the show of Antje Pfundtner's contemporary Nutcracker choreography. Our idea was that Sven Kacirek plays his re-composition of one piece in four separate layers of instruments. The video artists Agnieszka Krzeminska has recorded his performances on piano, marimba, percussion, and vibraphon. 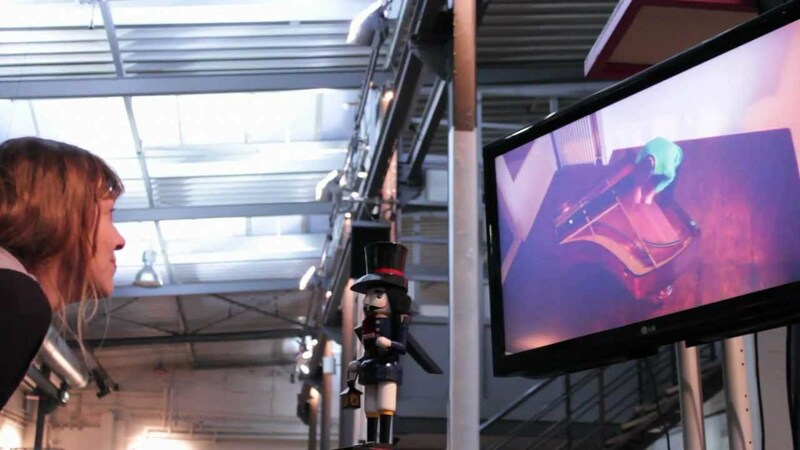 These videos are played back on four screens, positioned on a 10m square, each guarded by a nutcracker. Nothing can be heard. As soon as curious people enter the space in between the nutcrackers, proximity sensors in the nutcrackers' eyes dynamically activate the sound. A mechanical hurdygurdy with a digital heart; the machine translates drawings on a blank CD body by the user into sound through a camera input. Every user can play their own drawings by placing the CD onto the hurdygurdy and moving the crank. The mechanics have almost entirely been built from old bicycle parts. The played sound can be burnt onto the CD afterwards. This installation is a collaboration with Corine Wiesenbach, Jan Claussen and Florian Grote. It was premiered at the Hyperkult14 Festival at Leuphana University Lueneburg in 2014. A 4-channel sound design for a video projection dome by Max Fey and Jan Gassmann, in which images of sky and subway impressions slowly alternate. "Puppets" constructed of old TV sets adiitionally show short movies which have been submitted by international artists for this project. The whole installation reflects various notions of distraction head-in-the-clouds fairy tale character Hans im Glück. My contribution to this beautiful setting is the sound design of the subway rides in between the cloud projections in the dome. It tries to simulate the sonic reality of a subway ride while adding artificial sounds to emphasize the artefacts a camera captures while filming out of a train inside a subway tunnel. This work has been presented for several months in a dedicated space made possible with a grant by the Hochschule für Film und Fernsehen in Munich in 2008. In 2010, I have been invited as co-curator for the Dockville Festival in Hamburg. It's a music festival with a "Kunstcamp" section focused on art before and during the festival. Together with Alain Bieber, Lucia Glass and Doro Halbrock we have invited 17 international artists to show their works on the festival area. My favourites were the spatial, mechanical sound installations by Tim Vets and Erki de Vries and the gigantic grammophone by Olle Cornéer and Martin Lübcke.